The band Mood Diver takes the term “start-up” to another level. They not only write music, they built a studio and self-produced music for two years before letting an audience in on the fun. The project was co-engineered by Chris and Maxx and produced by the entire band. To fine-tune the sound, they worked with Daniel Good (Nick Murphey, Cymbals Eat Guitars, Surfer Blood) to mix and master the tracks. Alixandra took five to chat about band life and inspiration for the new EP “Laze”. 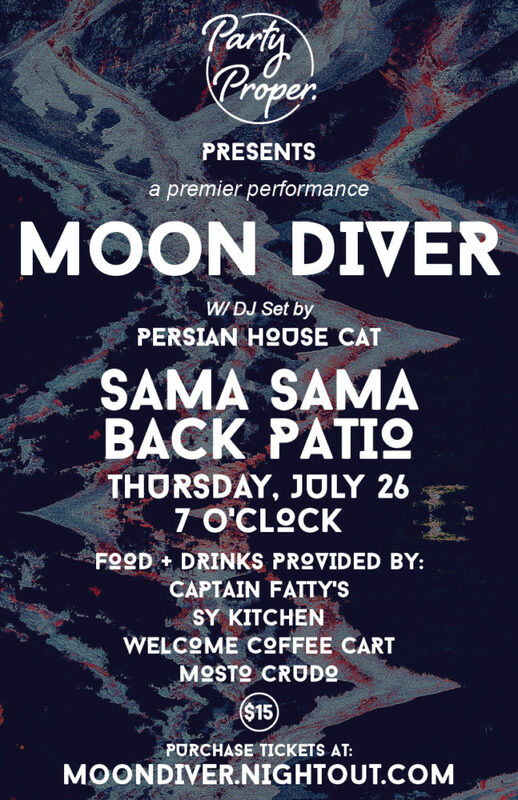 See Moon Diver’s – first ever – show on July 26th at Sama Sama Kitchen in Santa Barbara, CA. Show starts at 7 pm. Tickets here! Who thought up the name, “Moon Diver” and what does it mean? Maxx actually came up with the idea while he was on tour with Tycho (he’s their lighting designer) on a flight to Singapore. I think we all resonate with the moon and the symbolism: passage of time, cycles etc. With the addition of “Diver”, it’s all about taking that leap of faith, and trusting as you dive into the unknown. We also just love the way it looks on paper. I read in your press release that the Laze EP is inspired by “the loss of loved ones and the fragility of human relationships”. Quite a powerful message to deliver on your first release. Did loss inspire you and your friends to form a band? What kind of loss did the band experience to have the inspiration to write this music? Our band officially formed in 2016. Chris Norlinger (guitar, vocals) and I were previously in a project called Ghost Tiger so we’ve been creating music together for over seven years now. As Ghost Tiger came to an end we began working with Maxx Farris and then our keys player Chris Nava. During the past couple of years as we were developing the project, Chris Norlinger’s father passed away as well as a couple of other family friends and loved ones so the subject of loss and the beauty and fragility of life was definitely on our minds as we were writing the songs on LAZE. Many people aren’t familiar with the business side of music. What drove you to build a studio, self-produce, etc. Was it money, the ability to have full control over the music or both? What do they say, necessity is the mother of all inventions? We knew we wanted to approach this project differently and take the time to discover and develop our sound. We couldn’t afford to go into a big studio for the amount of time we wanted to put into writing and recording, so we decided to invest what we could and turn our practice space into a humble recording studio and do it ourselves. This was the best decision we could have made. It gave us the time and space to grow and experiment as artists without the stress and limitations we’d previously worked under. What is a typical collaboration day in the studio? Does everyone contribute to songwriting – lyrically and musically? Moon Diver is a very collaborative band with each member bringing their own unique background and strengths to the table. Chris Norlinger and I write all of the songs. We co-write some (Perennials, Wand, Feathers) and also write individually. When it comes to the music and arrangements everyone writes and contributes parts. We are in our studio all of the time and a typical day depends on what we’re working on. When we’re in recording mode it’s one thing, but the past few weeks we’ve been getting the live set ready for our debut show. We spend a lot of time working on tone. Not to sound like a parent but what is your five/ ten-year plan? What do you all hope for the future of the band? Our goal is to launch this project and get to a point where we are sustainable financially so we don’t need to be juggling multiple jobs. We’d like to have a great team (label, booker, manager etc.) and be touring the world. Most importantly we want to continue to explore and create together and make music that excites us. Each of us individually wants to be working on other musical projects as well. Chris Norlinger is starting a solo project called Kim Shimmers. I’m working on solo music. Maxx is a professional touring lighting designer. Chris Nava produces hip-hop artists, is a composer, and also is working on solo work. The ultimate dream is to be as creatively active as we can be on our own and as a group. Your debut at Sama Sama Kitchen will be your first time in front of an audience. What kind of emotions go through your head knowing your music will finally be heard live? Excitement? Concerns? We are so excited to finally share these songs with people. We’ve spent so many hours in our little space working on this music so it’s time to let go and share it. We’re really happy to be teaming up with our pals Party Proper to throw a magical summer party and celebrate with our family, friends, and friends to be. What other music does Moon Diver listen too? Was there an album or artists that inspire your sound? We all draw inspiration from so many backgrounds from classical jazz, hip-hop to blues. Radiohead is one of our biggest inspirations as well as LCD Soundsystem, Tame Impala, King Gizzard and the Lizard Wizard, Fleetwood Mac and the list goes on. *Sama Sama Kitchen will have a full bar cart (cash/credit) and local vendors Sy kitchen, Mosto Crudo, Welcome Coffee Cart, and Captain Fatty’s will be providing free bites.